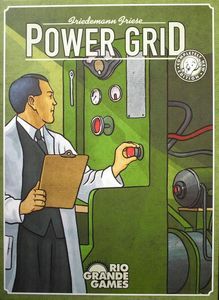 Power Grid PriceCompare, Buy this board game at the Lowest Price. Connecting cities involves paying connection fees and placing your tokens on the connected cities. There are clusters of cities on each board where the connection fees are pretty cheap, but building in those areas means competing against more players who also want to take advantage of the cheap connections. Power Gridalso divides the game into 3 phases: starting, growing and matured phases. Progressing from one phase to the next changes the amount of raw materials that are replenished each round, and also increases the number of players who can connect to each city. The game also has expansion boards and power plant sets. New boards include France, Central Europe, China and Korea, and each introduces interesting aspects to the game. For example, the order in which power plants are revealed in the China game reflect's the country's planned economy. Similarly, there are 2 resource markets in Korea to reflect the separate North and South economies, and the North Korea resource market doesn't have uranium (right…).